Tiffany Harper and Chasity Boyce are not going to let minority women lawyers vanish. While large law firms are seemingly all pushing for equality, the stats paint a much direr picture. A 2016 report from the Minority Corporate Counsel Association foundthat law firms are employing fewer black lawyers than they did in 2009. And nationwide, black women make up less than 3 percent of associates and less than 1 percent of equity partners. In order to fill law firms with qualified women of color and to address these dismal numbers, Harper and Boyce, diversity and inclusion leader at Skadden, Arps, Slate, Meagher & Flom LLP and Affiliates, cofounded the Diverse Attorney Pipeline Program (DAPP). Modern Counsel spoke with the founders about how the program was formed, how it has evolved, and how other lawyers can become an ally for the greater good. How did the two of you meet and start working together? Chasity Boyce: We both served on the board of the Black Women Lawyers’ Association (BWLA). Tiffany became president of BWLA, and I was vice president. The following year, I became president, and she remained on the board. We started to have conversations with firms and in-house counsel about their diversity and inclusion issues—specifically, about the void of black women lawyers. When did the idea to create DAPP happen? CB: Working at BWLA, we held the 2015 National Summit of Black Women Lawyers. We brought women lawyers from all across the country to have a conversation about how we were fading from the practice and to determine how we could create our own destinies. We want to flood the pipeline of women of color lawyers to large law firms. We just decided that we were going to create DAPP. After that, we just needed to find some law schools and put some structure to the program. 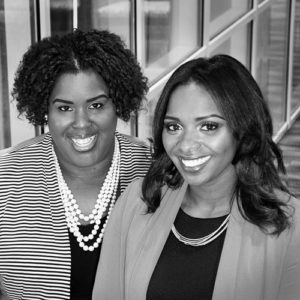 Chasity Boyce and Tiffany Harper know there are countless women of color ready to lend their talent and expertise to the legal field. All they needed was a program to help them get started. And that’s when the Diverse Attorney Pipeline Program (DAPP) was introduced. After funding the program themselves and piloting it at the Loyola University Chicago School of Law, Harper and Boyce initiate the DAPP program at the John Marshall Law School. In April, the American Bar Association’s Section of Litigation recognizes DAPP with the Diversity Leadership Award. Just four months later, DAPP begins running throughout the city of Chicago. Harper and Boyce plan to expand the program to other areas, such as Washington, DC, and Atlanta, within the next five years. Tiffany Harper: We hadn’t seen another pipeline program that was specifically focused on women of color, first-year law students. We want to be the “Robin Hood” and bring opportunities and resources to those who wouldn’t ordinarily have them. That was my aha moment. CB: We knew about other great pipeline programs that help get people of color into law school, but nothing as intensive as what DAPP is. If there was ever a good time to do it, then it was while we had a wealth of resources at our fingertips at this national conference. At one point, we were trying to figure out how many black women lawyers we could name that still worked inside law firms that were around our age. We barely had to use two hands. During that time, we had a lot of conversations where people high-up in firms would say, “We would have more black women lawyers if they were like the two of you.” That’s always perplexing because we know so many talented women of color. We needed to do something. That’s such a troubling sentiment. What do you do to prepare participants in DAPP to handle comments like that? TH: In diversity in the legal profession, there has been a very top-down approach. Lots of money, time, and effort has been spent trying to teach management about how to be more diverse and inclusive. But there hasn’t necessarily been as much from the bottom up, which are the law students and the people in the pipeline. Our program focuses on trying to train them to navigate this because a majority of women of color law students don’t come from families with lawyers. When you go into the same profession as your parents, that’s often where you find that support. You’ve got contacts, a network, and you know how to play the game because you watched them play it for eighteen years. We come with that deficit. We also just want to be there for our students when they encounter diversity issues in the profession, because it will happen. We saw the disconnect between firms saying, “If we found people like you, we would hire them,” then simultaneously knowing all these women of color lawyers who were super qualified. We thought we could prepare this group to interact better, and impress this other group and play by their rules so they can get in the door. You had never undertaken anything like creating a whole pipeline program before. What was that process like? CB: We’re lawyers, so we’re researchers. We looked at the structure of other programs that existed. When you don’t have something exactly like what we are trying to do, you have to look at other businesses and professions. But what we had going for us is that we’ve been through law school. We worked to try to find jobs and had very different experiences in that Tiffany went to a top twenty-five law school. I went to Howard for law school. We had a lot to draw from and we had a circle of women of color lawyers that we could consult and draw from their experiences. We worked to develop a program that would blend the experience of being a person of color in law school with all of the business considerations that exist for major law firms. TH: Around 2008, it was the height of minorities in big law. Every year, the numbers rose for associates and partners across all ethnic backgrounds. In 2009, when the economy crashed, minorities—many of whom were asked to leave—left in droves. I graduated in 2008 and Chasity graduated in 2009. We started our career in a recession, dealing with being diverse when things were scarce. Minorities are often the first to go or are the last to be offered. Some racial and ethnic groups are on the rebound, but for black women and Latina women lawyers, they are still in a decline. The numbers never returned to 2008 levels and are still declining. We wanted to impact this trend. We want this trend of constant decline to stop. We’re not going to stop it immediately, but we want to try to plug that hole—putting as many fingers as we can into that hole to stop it from dripping. And we’re aware of phenomenal pipeline programs, but ours is more holistic. We’re working with students on academics, professionalism, and placement. The hope is that, by the end of the 1L year, we have given them so much that they can take what they learn and then use it to propel themselves. How has the program evolved since it began in 2013? TH: When we first started the program, we knew the stats said that black and Latina women generally don’t score as high on the LSAT. So they’re getting into law school, but they have lower scores than everybody else in the class. Because of that, they are almost always in the bottom one-third of the law school graduating class. It’s hard to say you should hire someone if their GPA says that you shouldn’t, right? We struggled a lot with whether we could actually change this paradigm. There are obviously a lot of other things besides your GPA that make you a good lawyer, but trying to convince someone of that is probably a lot more difficult than it was to try to work with the students. The first year, we only had three students, but they had LSAT scores that were not only well below average for law students, but also for African Americans entering law school. A big part of our curriculum is breaking that correlation between low LSAT score and being at the bottom of the class. When we select students, we often look at students whose LSAT scores are 145 or lower, because those are students who are at risk to not even complete the first year. At this point, we’ve seen a lot, so when students enter our program, we can spot academic issues early on. CB: Initially, we tried one-on-one mentoring. But that became difficult because we tried to have mentors who were inside of large law firms. But the practice is extremely unpredictable. You could think you have a whole afternoon free, but then you suddenly don’t and you have to cancel on a law student. We’ve played with mentor circles and summer mentors, which are different from what other folks have. Any surprising things you’ve learned? TH: I never thought we were going to do so much on empowerment. We spend a lot of time, more than we would like, convincing students that they should be there. Just because they are in classroom where no one else looks like them that they should still be there and that they’re valued and that they deserve to be there and deserve to have a seat at the table. That weighs on them more than we ever expected. But we’ve found that it’s such a crucial piece of the program. When we think about expanding the program, one of the things that keeps us up at night is that we still have full-time jobs. We can’t do this program 24/7 and do it in fifteen different cities. We’re struggling with how to scale it with the program. In hindsight, the empowerment issue must seem so obvious. How large is the program now? I know you started with only three students. TH: We have eleven. This is the first year we’ve run at multiple law schools. One school is fine. Three schools, which is what we have now, is a challenge because we didn’t know how we were going to do it. Also, tripling our number of students as well meant this year was a stretch. But it’s been good experience to interact with students from different schools and hear the concepts differently. It helps in the learning environment when professors come in and teach or when we’re teaching. When we think about expanding more, there is probably a maximum per city because a big part of our experience is individualized and customized. But I don’t know where that limit is. We haven’t reached it yet. CB: Another way that we’ve evolved is that we now have a board of directors. When we started, it was the two of us and some volunteers. Now, we have nine black and Latina women in Washington, DC, Maryland, Tennessee, and Chicago who help take this on. Optimism is high from Chasity Boyce and Tiffany Harper that diversity will continue to improve in the legal workplace. But statistically, law is the least diverse occupation in the nation. It must be tough to look at how bad some of the stats are and then say, “We can fix this.” Do you consider yourselves optimists? CB: I think, overall, we are optimists. We very much think that DAPP could be a program that could empower 100–150 women of color every single year to continue on the path and to continue to be lawyers. Maybe one of us is more an optimist than the other [laughs]. TH: I think it depends on what you’re asking us about. If you’re asking us are we optimistic about the chances that our girls have to succeed in this profession? Hands down. Two hundred percent, we’re optimists. When you ask about the direction of where the profession is going in terms of diversity? I go in and out on being optimistic about that. CB: I’m optimistic on both fronts. While I’m often frustrated with what seems to be a stagnant profession in terms of becoming more diverse and inclusive, I’m optimistic. I know a lot of great people that are fighting inside of firms, corporations, and government entities to make the practice better. TH: And we expect our mentees to help, too. The students from our first class actually volunteer and intern for DAPP. We expect them to pull other women of color with them as they go into the profession. And if we’re all pulling, the tide of the stats is going to change. This is a long game we are playing, and we knew that. The more people that we have aware of how they can impact and change and pull people with them, the better off we’ll be. Law is one of the least diverse occupations in the nation, with 88 percent of lawyers being white. In a legal world full of older white men, what can that majority do to help increase diversity and inclusion? CB: Be partners and allies. The truth is that you’re the problem and the solution. I say problem because the practice of law was created by old, white men. They need to be the voices that are speaking up in the room. They need to be willing to share some of the profits and some of their work. At some point, the world is going to dictate that the practice of law looks very different. We’re lawyers. We like to win. So you want to be ahead of the curve and be a part of the solution. And be open and intentional. Be open to the idea that just because a diverse person misses a comma or doesn’t use the language that you expected doesn’t mean they’re not smart enough to do the work. TH: I think that it’s a lot for many people to grasp because it’s a concept that seems to takes a lot of effort. People are busy and are already giving a lot. The one thing to do is that if there is one law student of color you can provide opportunity to, do that. It takes something as small as taking $5,000 out of the budget and saying we’re going to have a paid intern who is a minority law student. Or it could be someone they already work with. Staff them on a big piece of litigation. It might seem like a small thing to do, but it’s huge for that person’s progression. When you see an opportunity to take resources and open them up to people who ordinarily don’t get them, then take it.